I love cooking with wine. Actually, not only wine – sherry, brandy, whisky, liqueur . . . Something magical happens when you add a tiny tot of brandy to a sauce, a splash of wine to a bredie. I watch in awe when I flame the brandy in my pot of coq au vin and quench the fire with a good full-bodied wine. My grandma’s sherry and mushroom chicken casserole is an old favourite. And who can refuse a good Cape Brandy tart. I’d sell my birth right for a salmon pasta with a hint of vodka. I love making the wine cake from the old South of America. And my friends don’t call my Jack Daniels cake Karen’s PC hip flask for nothing! But as much as I like using alcohol in my recipes, I hate the taste of alcohol that hasn’t been cooked through properly, or the uneasy feeling that the balance in completely out of sync – way too much alcohol or the wrong choice of tipple. Even worse, a cheap brand that kills the dish. One – or rather two — of my latest discoveries is the Marula Fruit Cream and the Strawberry Cream liqueurs from Four Cousins. I’ve been experimenting in search of the perfect dessert for Christmas and came up with these delicious little sweet breads, pairing the Marula cream with Lindt’s Extra Au Lait Milk Chocolate and the Strawberry Cream with Lindt’s White Chocolate. These decadent little breads are a bit flimsy and in need of a bit of support. You should be able to find mini loaf cases at speciality shops. Cream the sugars and butter and add the vanilla extract. Beat with an electric whisk or wooden spoon until light and fluffy. Gradually beat in the eggs, one by one. Then fold in the flour, baking powder, cream and Four Cousins Marula Fruit Cream. 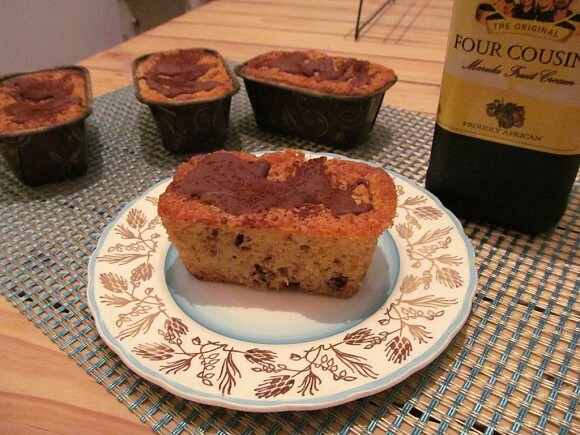 Fold in the chocolate chips, then divide the mixture evenly between 12 mini loaf cases. Place the cases on a baking tray at least 1 cm apart, and bake for 25 – 30 minutes in a preheated oven of 180˚C. Allow to cool on a wire rack. Melt some extra chocolate and drizzle over the breads to garnish. Dust with cocoa powder. Cream the sugars and butter and add the vanilla extract. Beat with an electric whisk or wooden spoon until light and fluffy. Gradually beat in the eggs, one by one. Then fold in the flour, baking powder, cream and Four Cousins Strawberry Cream. Fold in the chocolate chips, then divide the mixture evenly between 12 mini loaf cases. Place the cases on a baking tray at least 1 cm apart, and bake for 25 – 30 minutes in a preheated oven of 180˚C. Allow to cool on a wire rack. Melt some extra chocolate and drizzle over the breads to garnish. Dust with icing sugar.